Spend your holiday in this beautiful holiday house, which offers a combination of tradition and modernity. It consists of three separate residential units with terraces inbetween. Spend your holiday in this beautiful holiday house, which offers a combination of tradition and modernity. It consists of three separate residential units with terraces inbetween. 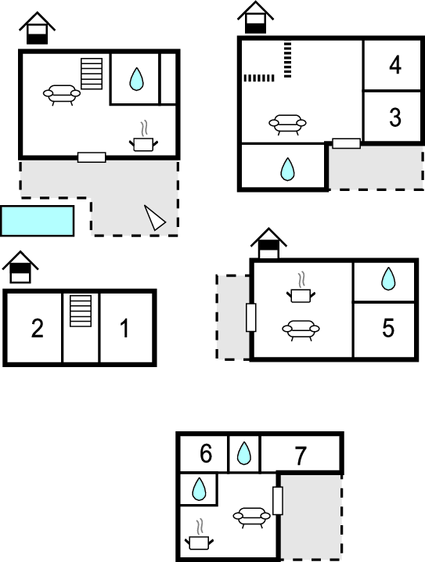 Two bedrooms are on the first floor with minimum ceiling height of 50 cm. The pool will surely provide water lovers a lot of fun, while the whirlpool offers pure relaxation. The children will have access to the children's playground, while the older ones will be entertained by the billiard table and table tennis. Here you are a few minutes drive from Orebic. Recommended are a visit to the neighboring island of Korcula and a wine tasting in local taverns. This beautiful villa is made from brick or stone and was originally built in 1724 and refurbished in 2018. The agent has rated it as a four star property so it is a well-equipped villa with above average furnishings. It is also great value for money. This villa has a swimming pool and restricted sea view; it is also located in Stanković, only 1.5km from Orebic. It is set in a very convenient location, just 500 metres away from a sandy beach. There's also a restaurant only 500 metres away. The villa has free wireless internet. You can also park on-site at no extra charge. The villa is well equipped: it has a refrigerator, microwave, washing machine and dishwasher. It also has a barbecue and some garden furniture outside.